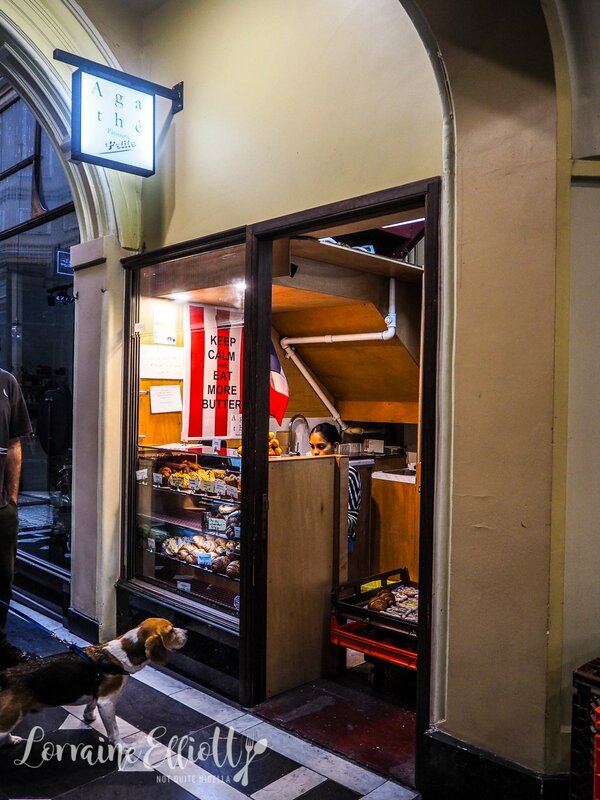 Down a little corridor in the Royal Arcade off Elisabeth Street in Melbourne lies a tiny shopfront or "petite shop" that defines "Hole in a wall". It's the city outpost (or inpost?) of the popular Agathé Pâtisserie. It's where people line up and get their fix of French pastries and croissants. 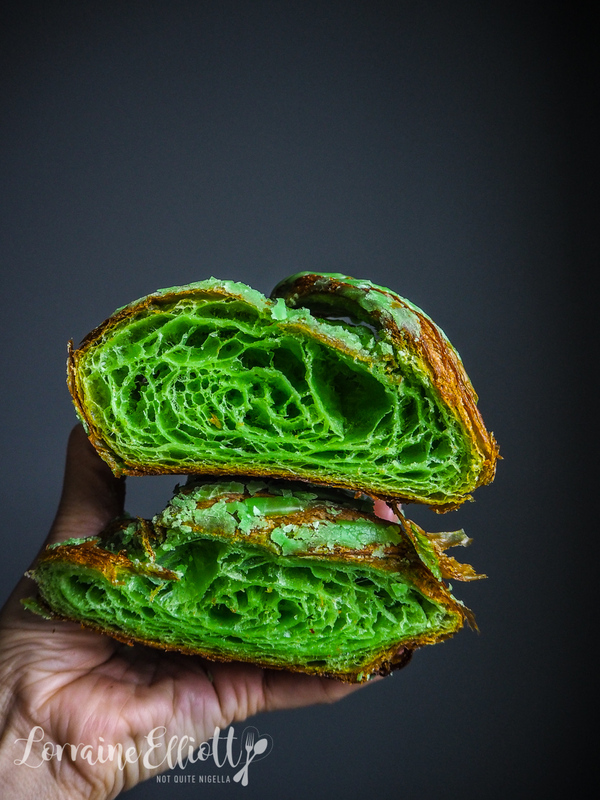 It is also the only shop to get their delicious croissant specials like matcha and pandan. There's not much that will get me up early in the morning. The only two things are probably going to be an early morning flight or the idea of eating pastries. 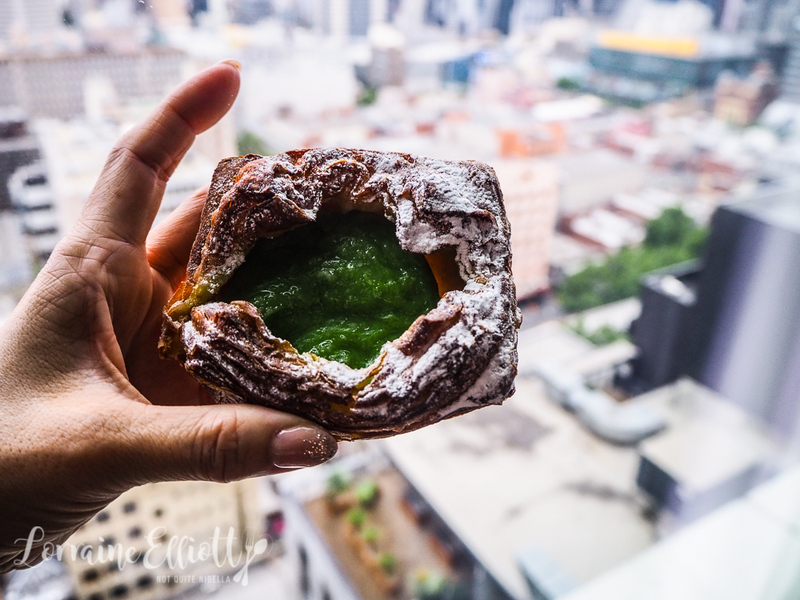 I had attempted to visit Agathé Pâtisserie the day before but a freak Sydney storm delayed flights and it was closed by the time I got in to the city. So I set my alarm at 6am, had a leisurely cup of tea in bed before my workout and was standing in front of Agathe by 8am when it opened. The girl before me is ordering her pastry in broken French. 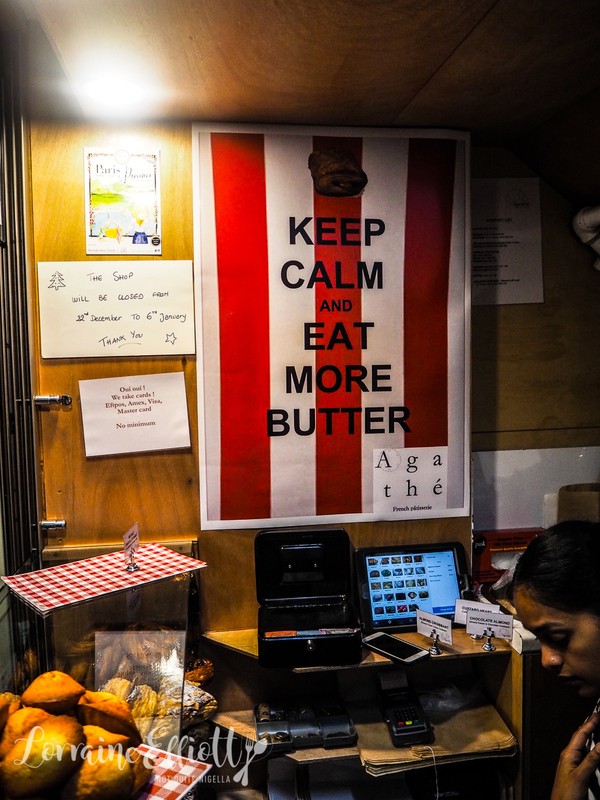 She's got the most important words (the pastry) but the adverbs are missing. And she gets a little French lesson from the woman sitting down behind the counter. 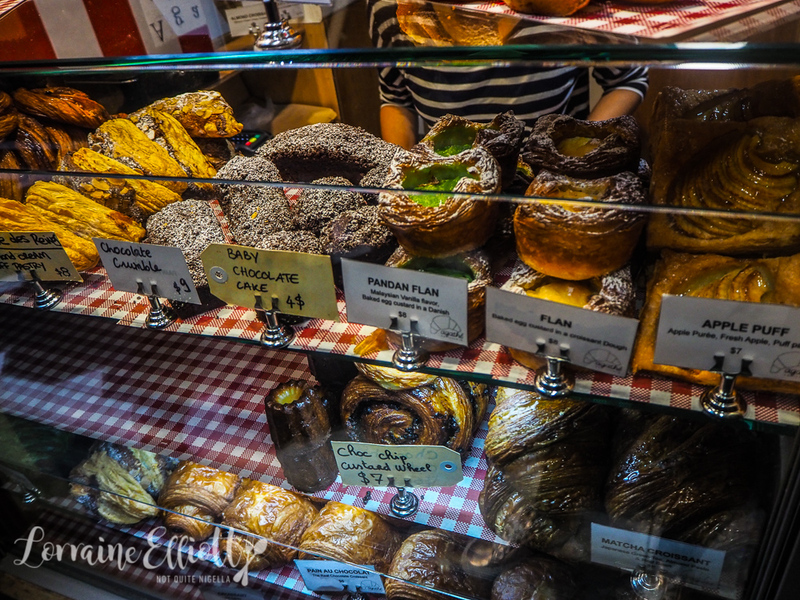 That gives me enough time to contemplate the small glass display of pastries. 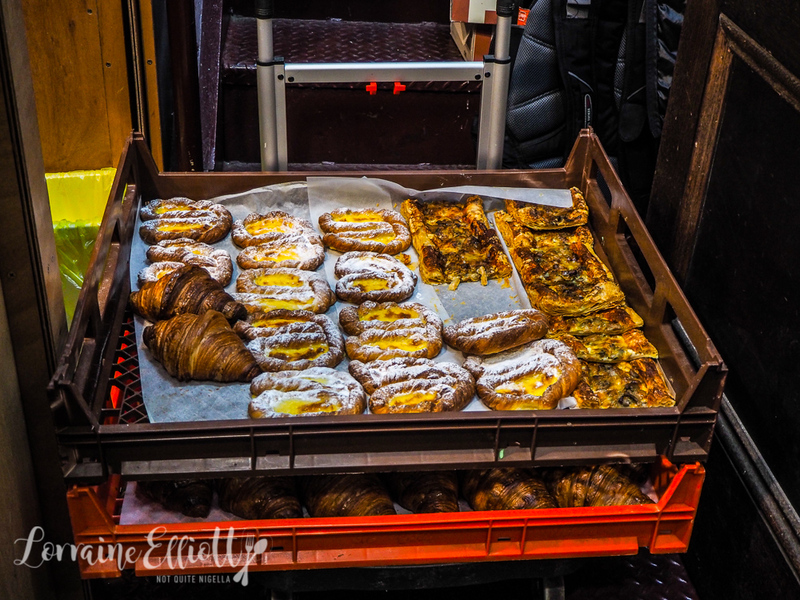 They've also had a delivery with more pastries and Danishes. 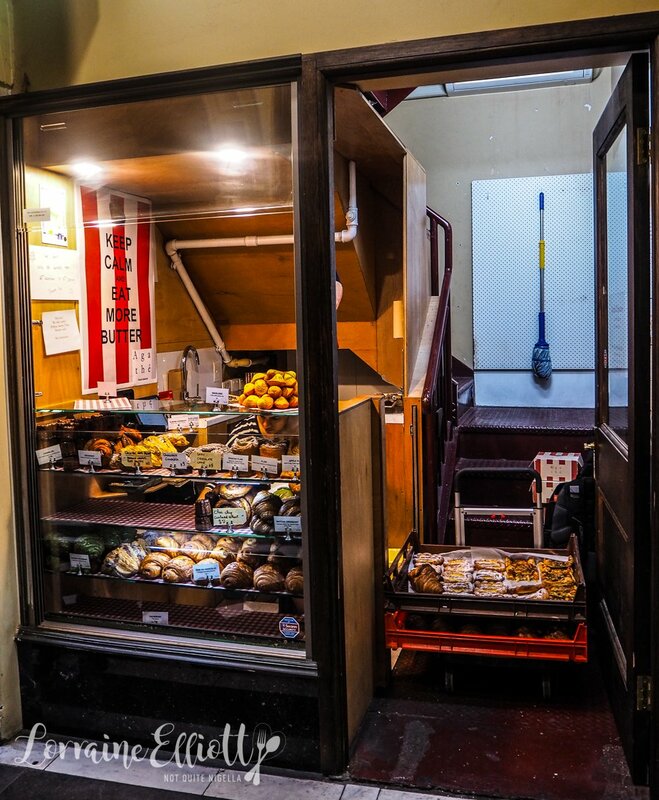 The city store is tiny - the South Melbourne Market store is larger and they bake every 2 hours so you're more likely to get a warm croissant but this small shop is convenient and busy with a steady patronage. Parisian born pastry chef Agathé Kerr is behind Agathé Pâtisserie. The former IT worker from Paris was posted to Sydney in 2001 and that was where she met her husband. After a few years in Sydney she "took him home with me" to Paris. They had three children who were born in Paris but then returned to his hometown of Melbourne looking for a more relaxed lifestyle and to be closer to his family. 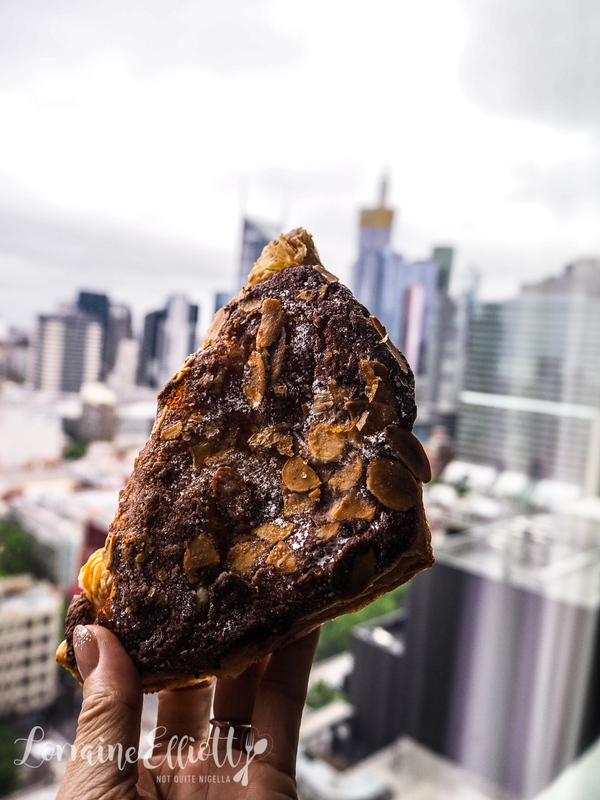 They arrived in Melbourne in 2013 and she decided to change careers in tandem with countries and soon started baking in her home for friends and to sell at markets. She was never interested in baking and "It was not in my family, I had no time, I was just eating crap, frozen food. I didn't even have an interest before. My parents didn't even bake, dinner was really basic, my mum she was a lawyer and they were always busy." 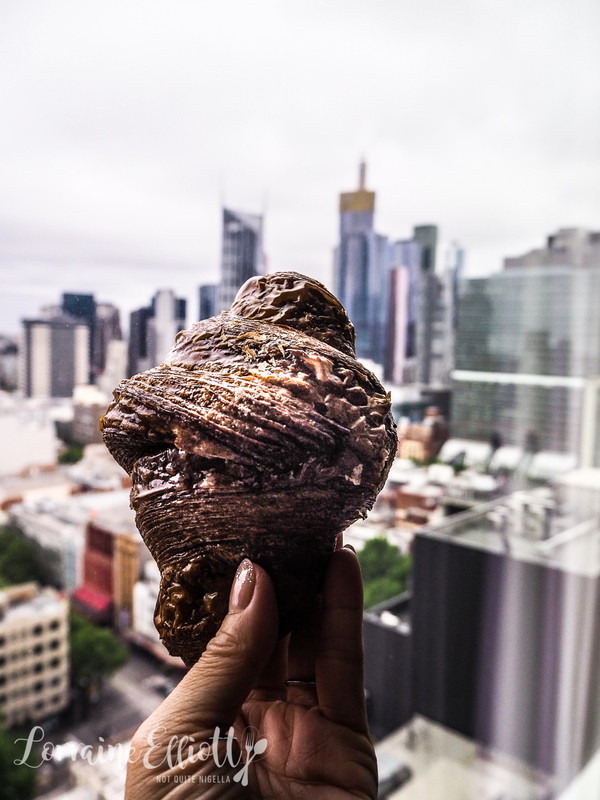 Agathe says, "I was thinking of what people like here and I know that Australians like French culture so I had to think about what are the French famous for? Food, wine and desserts." It was over a class at Lenôtre making a strawberry cake that she fell in love with the transformation of the ingredients. She was still working during the day but baking macarons at night and discovered how relaxing it was. I end up with a selection of six goodies. 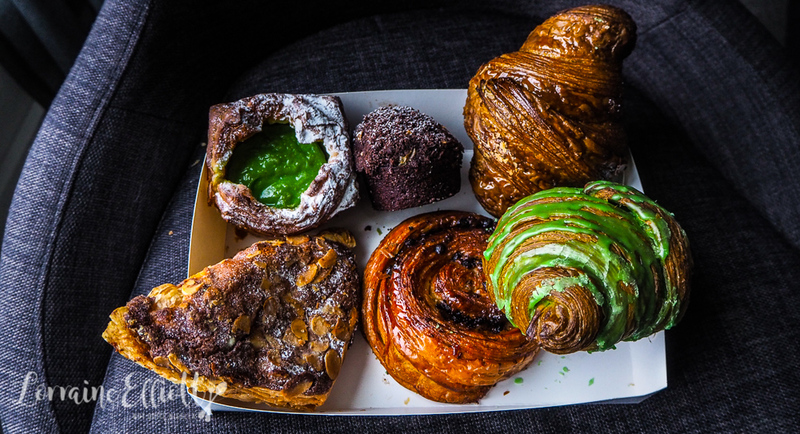 In the box are two croissants-the pandan and matcha as well as a choc chip wheel, almond galette, a pandan flan and a baby chocolate cake. I'm slightly sad that I've missed out on a garlic snail or foie gras croissant but I am still delighted with my bounty. Taking them back to my hotel room I can't wait to try them. 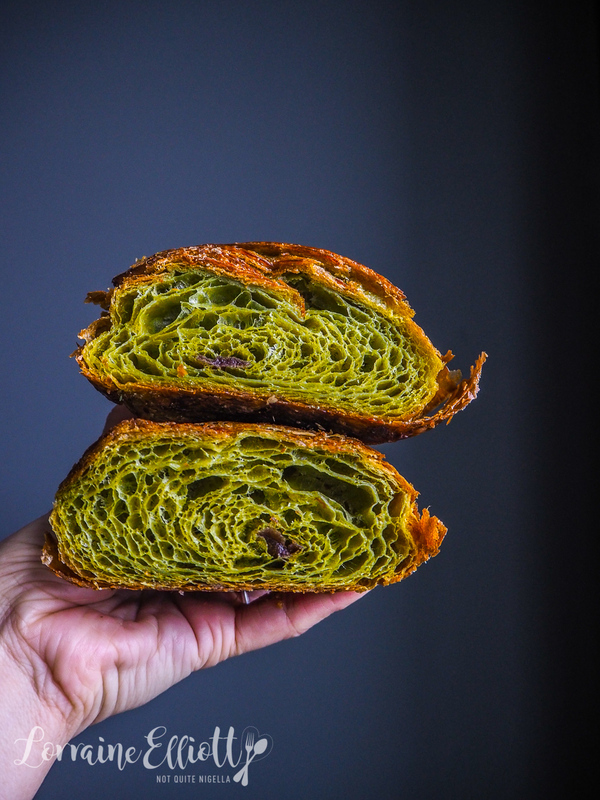 First I try the matcha croissant. It's a matcha butter outer with a strip of red bean filling. I had been warned that the matcha was not overly strong and it isn't. 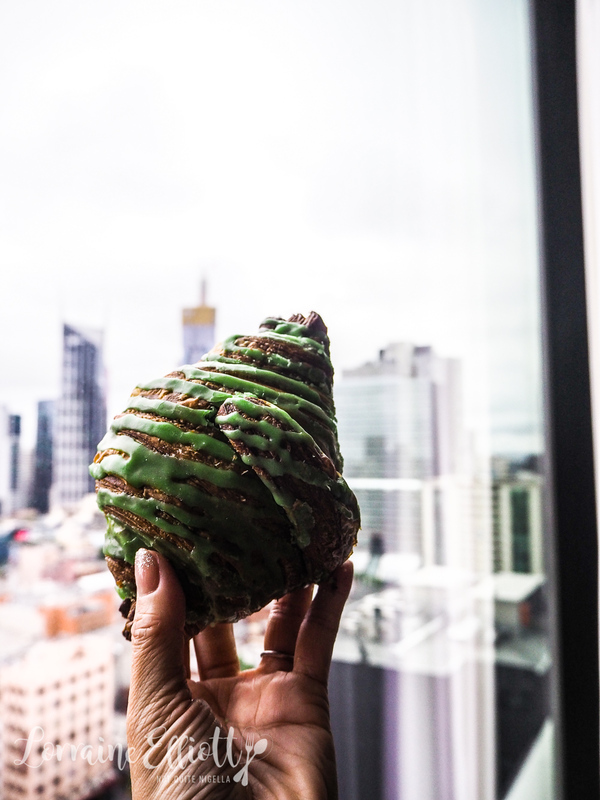 If you're a matcha lover then I think you'll be wanting for more of that signature bitter tea flavour. The matcha flavour is there but it's just not as in your face but the red bean does go with it quite nicely. It is beautifully buttery and you can really taste the butter that they use (a New Zealand brand called Canary). The next item I try is the pandan croissant. This is my favourite of the entire lot. The pandan flavour is mostly in the icing but it's such a delicious combination of butter and tropical pandan or screwpine leaf. In fact I finish this in its entirety deciding to not tell Mr NQN that there was a pandan croissant in the mix (he'll never know :)). The next pastry is one that I wasn't sure that I would like but it came highly recommended. You see Dear Reader I don't really like pain au chocolat. I find it never does either a croissant or chocolate justice. And as expected I don't really love this one but if you love pain au chocolat then this might be for you as it provides a more even distribution of the chocolate chips than the single strip in the centre. The next is a galette des reines or Queen's galette in a triangular shape. There is an eggy almond frangipane inside and on top with flaked almonds on top. The custard is very eggy and this dominates over the almond flavour. Mesmerised by the green pandan custard I added the flan at the last minute. It's a silky, thick custard centre nestled in a cup of pastry. It's all sorts of wonderful from the generous filling of custard to the buttery layers. And there's also a vanilla version if your tastes run more that way. And then comes my second favourite item, the unassuming looking baby chocolate cake (there's also a larger loaf cake version). 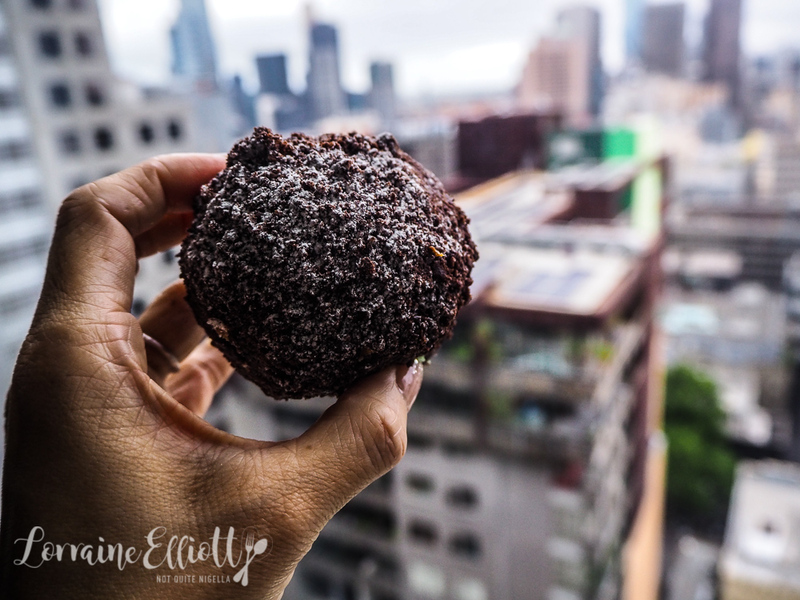 Whilst it may look simple, the cake has a fine, tender crumb, just moist enough but light but not dense or muddy while the chocolate topping is divine. It's the sort of cake you could buy as a gift to give someone and then buy one yourself and then freeze it (that was their recommendation). Or maybe I'm anticipating my next move when I return to Melbourne. And the question that many people ask, how do they compare to Lune Croissanterie? To do them both justice I'd probably have to do a blind taste test but they're both excellent croissants. The main difference probably is in the flavours that each shop has and in that respect that is their main point of difference. So tell me Dear Reader, would you choose vanilla or pandan? 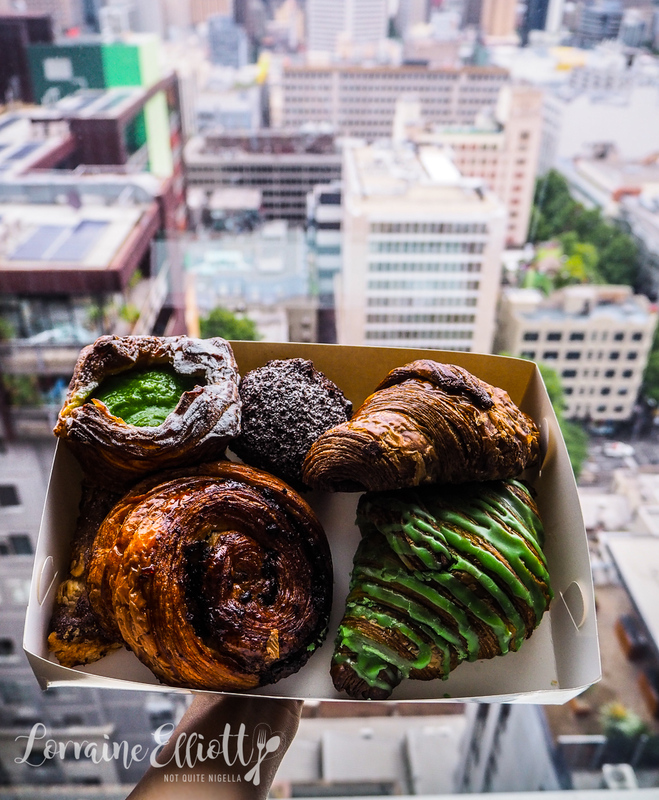 Have you tried the croissants here and what do you think of them? 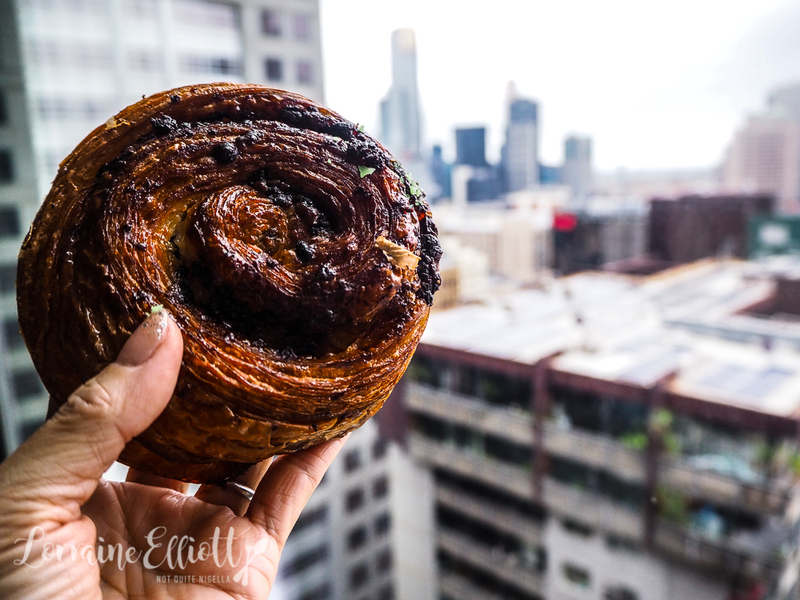 Who has the best croissants in your opinion? These pastries were independently paid for.